Fascinating intervention yesterday from the People's Remain Speaker of the House of Commons. He reminds me of the Premier League referee who gives out pedantic red cards and penalties because he thinks the crowd has come to watch him officiate. While I'm frustrated that Theresa is still trying to get her awful deal through Parliament I'm at least pleased that she is resisting the demands for a long postponement of the leave date. It looks at the moment as though the EU filth are not going to permit even a short extension without the withdrawal agreement going through. I think that this pistol-to-the-head diplomacy might persuade a few more MPs to buy it, but I don't think it will go through ultimately. Something's got to give soon but I fear the losing side in the defining political question of our time sees an opportunity here to impose its will over the voters, to betray and defy the people. At the same time though, at least a clean break is now more likely than an awful compromise. But the stakes are high. If the political establishment defeats the people, we're reaching the point where many will feel that resistance by any means necessary is justified. The establishment might be able to force us to remain prisoners of the EU, but it cannot turn back the clock. This whole sorry exercise has heightened contempt for and loathing of the EU among those of us who recognise that it has manipulated and coerced us, this last three years. The question of who governs us requires goodwill and consent. When an organisation presumes to lord it over us in the face of explicit rejection at a referendum, those things are in shorter supply than anger, frustration and hate; all of it justified. Many years of bitter resentment and conflict may lie ahead of us. Furthermore, Europe has been a source of division in our politics; not only in the Tory Party, for decades. For goodness' sake let's get out of that shithole. Deal or no deal, this month or June, no longer. By the way I've heard it said so often that the referendum was called to ward off a split in the Tory Party that it seems to have entered the national consciousness as a simple truth. Can anyone explain why Nick Clegg was so keen to heal the divisions of the Conservative Party? It's been over THIRTY YEARS since the British people last had a vote on Britain's membership of the European Union. 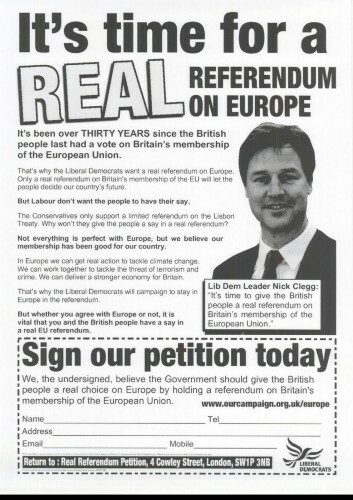 That's why the Liberal Democrats want a real referendum on Europe. Only a real referendum on Britain's membership of the EU will let the people decide our country's future. But Labour don't want the people to have their say. And let's be honest - neither do we really, and if you do get it wrong, we'll just make you do it again until you get it right. Just heard that Corbyn, the man who justified palling up to Hamas and the Provos with the remark that "sometimes you have to talk with people you profoundly disagree" has stormed out of a cross-party meeting this evening because Chuka Ummuna was present. "Former economics editor calls for massive VAT increase on crackers and cheese to help close the poverty gap!" Sod the revolution! I'll enjoy my bourgeoisie supper of Cathedral City and Ritz biscuits tonight. The revoke article 50 government petition is going crazy. 'First' kick of the can, although the EU limited her backswing. Probably more to come. CBI and TUC unite to condemn the possibility (more a probability by now?) of a No deal brexit. The EU have proved that for all their bluster they are desperately trying to avoid 'No Deal' by seemingly giving the UK as long as it takes. 2 weeks hardly fits that description! We just have to agree to field candidates in the EU elections and it can become virtually open-ended. I certainly wouldn't rule it out as there is no plan B. They blinked (and they'll probably blink again). The can-kicking is now being carried out by both parties.My guess is that the EU will start using the term 'managed No Deal' soon.